Ila Asepo. 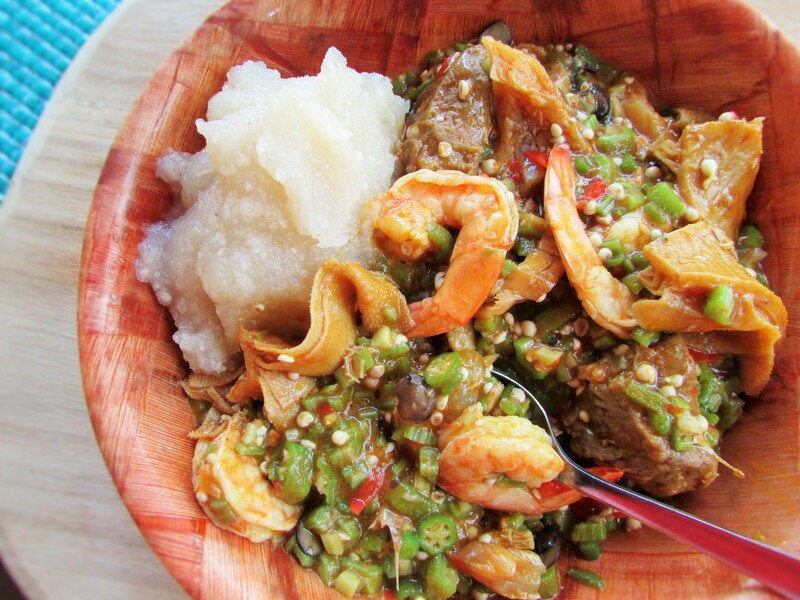 For The Love of Okra Soup. This was quite a successful recipe. My ajebutter 2 licked his soup bowl and fingers to no end. I kept asking him “Do you want more soup?” and he would nod in reply and as mommy, I would give him more. Both my ajebutters ate so much of the soup that when it was time for bed, they both sprawled in their beds like some full chicks and within ten minutes they were snoring. 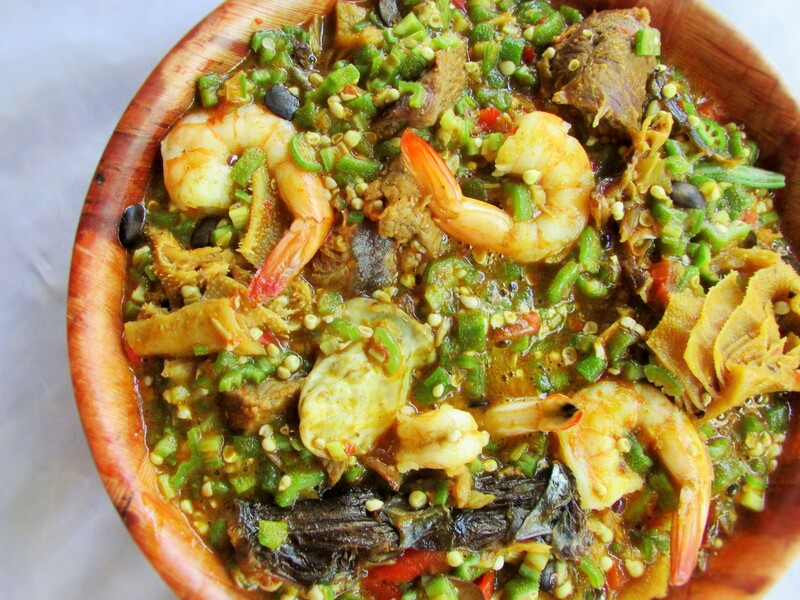 This particular type of Okra soup is indigenous to the Yoruba speaking people of Nigeria and in it goes one key ingredient called Akaun i.e. edible potash; which helps with the soup’s viscosity. Okay hold your breaks! Although, I do have a few recipes using potash or ngo’ (ngo is natural by the way and I love! ), I used baking soda. Yes baking soda does the same thing and it was easier to source too. Although I did not, but you may add any green vegetable of your choice. I like okra and bitter leaf. There is something “wowy” about it. I also did not use any onion, as it is a local recipe and Nigerian local recipes never really make the use of onion; plus the onion is known to reduce the viscosity of this soup. “How true is that?” I do not know 🙂 It is just one of those things you are told not to do in the kitchen. But, seeing the versatility of food, you may add some. I also used some Iru i.e. Locust beans for this recipe. It has quite a strong taste. This recipe calls for it originally, but you may leave it out. A little rinsing of the iru under running water kind of helped; not just to clean it, but to tone down that strong taste. We cooked, we ate and we conquered! in a medium pot, season the meat with salt, 1 tbsp. of dry pepper and the knorr cubes. Do not add any water. The meat would begin to simmer and produce it's own water. Let it cook until the liquid dries up a bit; then pour in some water to the level or a little above the level of the meats and check for seasonings. This entry was posted in Healthy Nigerian, Healthy Nigerian Dishes, Nigerian sauces, Nigerian soups, Nigerian Stew, Nigerian stews, Sauces, Side dishes, Sides, Soups, stew, Stews, Uncategorized, Vegetable soup and tagged ila asepo recipe, Ila Asepo soup, Nigerian okra soup recipe, Nigerian Okro soup recipe, oil free okra soup recipe, oiless okra soup recipe, Okra soup recipe, Okro soup recipe. Ah! Auntie, you will not kill us with this your posts. Mouths are already salivating. I don’t eat okro but I’m surrounded by people who do. Looks really nice and sounds easy. I’ll try it for them tomorrow!